Banquet manager, Jason Yoder, has reported seeing a ghostly boy sitting on the front staircase. he has no doubt he's working in a haunted hotel. He said dishes sometimes break when no one is around, along with knives and forks flying out of his hands. Several times the manager has heard people celebrating, as if enjoying a party. Yet, there was no one in the building. On one occasion Jason heard the sounds of people talking and dishes clanging in the upstairs. Knowing there was no one in that area he left the building, but forgot his keys. He came back for his keys and noticed the sounds shifted to the downstairs area. He reported running out the back door. The owner also reported many of the employees and customers have complained that they have felt someone brushing past them, but there was never anyone near them. A Ghost From The Early 1800s! It's hard to comprehend someone actually haunting a building that was once a customer or possibly an owner almost 200 years ago. There's so much Pennsylvania history connected with this region and many ghost sightings throughout Central Pennsylvania. The 1800s was a time when there was no electricity, and very little communication. The only transportation families would have enjoyed would have been horse and buggy or the historic PA Canal Basin, located across the road from the U.S. Hotel. The Historic Pennsylvania Canal Basin had just been completed when this now famous Allegheny Mountains historic haunted hotel was built. The Pennsylvania Canal had 14 daily canal boats loading and unloading goods. The small community of Hollidaysburg, PA was gaining recognition as a booming and growing community. Pennsylvania history was being recorded. It was the frontier of a young nation. The Pennsylvania Canal provided the luxury of people and goods to be shipped to and from the west. Twenty years later the canal shipping business was replaced by the now historic Pennsylvania Railroad. When I attended the ghost hunt at the Altoona Railroaders Memorial Museum I jumped at the chance to talk to Patty Wilson about other haunted sites in the area. Patty told me about her last experience at the U.S. Hotel. She laughed as she told me about couple of ghosts that are real characters. Patty Wilson explained, "He likes to play tricks and tell me jokes. But another ghost is grumpy and shouts at me to get out!" She invited me to attended an upcoming ghost hunt at the U.S. Hotel. The dinner event was being planned for the following week at the haunted hotel but my schedule didn't work out. No doubt I will be attending a ghost hunt there one day! 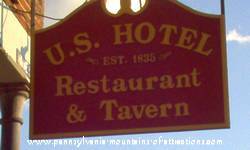 Stop by the U.S. Hotel the next time you are in the area of historic Hollidaysburg. The food is fabulous and they have live entertainment on many evenings. Sometimes the entertainment isn't live but it's always entertaining! Who knows which ghost will be joining you for dinner at this legendary historic haunted hotel. 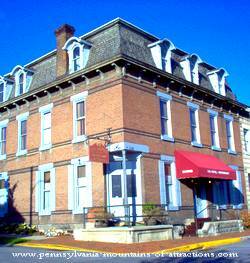 Have you heard the story about the famous Historic Haunted PA Brothel? It's located in Bedford County. The building and the brothel dates back to the 1700s. You'll also enjoy finding another famous haunted Tavern in the Bedford County area. Historic Jean Bonnet Tavern is known for it's ghost sightings that also date back to the 1700s.